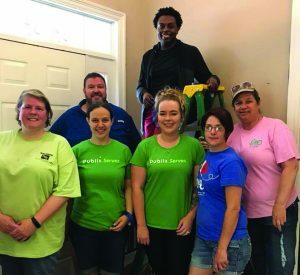 In early May, the United Way of Baldwin County held its annual Day of Caring, an opportunity in which volunteers throughout the community donated both their time and energy toward a total of nine service projects in Baldwin County. This year, a total of 100 volunteers participated in Day of Caring and spent their time doing everything from reading to pre-school children, to sorting food, to planting flower beds, to building a wheelchair ramp…just to name a few. Baldwin EMC had two employees participate in Day of Caring this year, including Member Service Representative Kim Williams, who spent her time at the Care House (Baldwin County Child Advocacy Center, a resource and referral source on child abuse) in Bay Minette. While Williams said she enjoyed her time spent in service, she said it tugged on her heart, too.